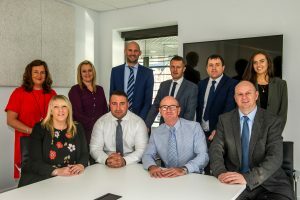 Langtree, which manages the 50,000 sq ft building on Dallam Lane for Warrington & Co, has confirmed deals with Meritec, Swan IT, Redwood Bank, Simple Solutions and Olive Construction totalling almost 4,000 sq ft.
And, says Jayne Furnival, group property director at Langtree, a further four offices at the popular building are now under negotiation. The spike in lettings sees the building remain on target for occupancy, with Steve Park of Warrington & Co citing the town’s enduring appeal as a place to live and work playing its part. “We’ve known for a long time that Warrington is one of the UK’s most entrepreneurial towns, so it was good to see the other side of the coin in the recent CACI review,” said Mr Park, referring to a national survey by the data giant that placed Warrington in the top ten places to live in the UK. New occupiers are supported by the active networking and advisory programme available to all the building’s tenants. Its BaseConnect programme now has more than 120 members from the wider Warrington region involved in a lively range of events, seminars and masterclasses.